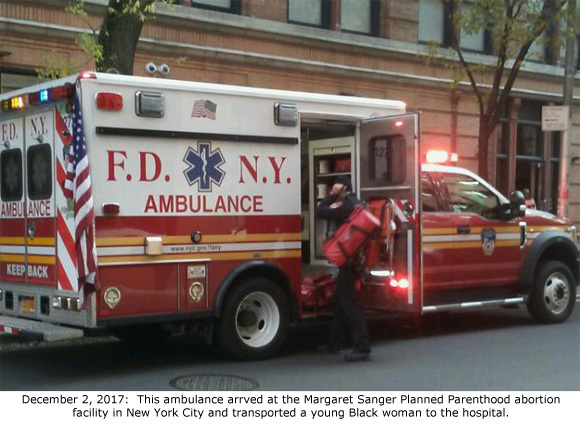 New York City, NY – For the eighth time this year, an ambulance has transported a woman from the Margaret Sanger Planned Parenthood abortion facility on Margaret Sanger Square in New York to a local hospital. During the incident, which took place on Saturday, December 2, 2017, an ambulance arrived at the abortion facility with lights flashing, but no siren. 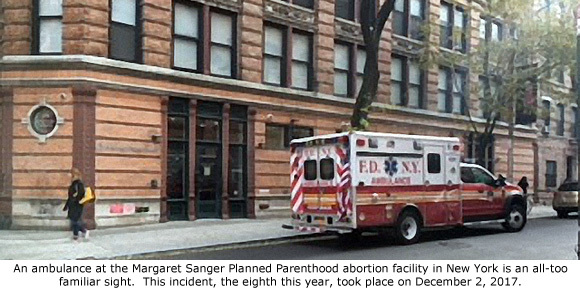 Emergency responders rushed immediately into Planned Parenthood, according to a witness who photographed the incident. The witness told Operation Rescue that after about five minutes, a young Black woman walked out of Planned Parenthood on her own and climbed into the back of the ambulance. A man who accompanied her to the abortion facility joined her there a few minutes later. The ambulance then rushed away, but only turned on sirens when it was about a block away from the Planned Parenthood facility. Operation Rescue has documented several incidents where abortion facilities have asked for ambulances to respond with no lights and sirens. This practice actually delays emergency care for those in need. The situation was so serious at a Planned Parenthood facility in Missouri, for instance, that the State Legislature passed a law this year making it illegal to request no lights and no sirens when calling for an ambulance. So far this year, 57 medical emergencies requiring ambulance transport have been recorded by Operation Rescue at abortion facilities nationwide. Of those, 35 have occurred at Planned Parenthood centers. Operation Rescue relies on pro-life activists who minister on the street at abortion facilities to report these incidents. However, many more actually take place outside the watchful eyes of pro-life supporters.